To celebrate the digital and 4k Ultra HD disc release of “Black Panther,” movie. Marvel Studios has teaming up with Xbox to brings you the Black Panther Xbox Sweepstakes. 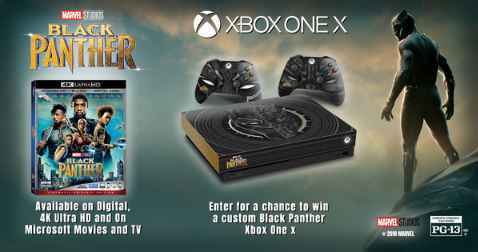 If you really want to win the custom Black Panther Xbox One X then you need to enter the Xbox Black Panther Sweepstakes once in a day at Blackpantherxboxsweeps.com from May 8, 2018 to May 29, 2018 for your chance to win 1 of 5 Black Panther inspired Xbox One X consoles and a 4K copy of the film for free. How To Enter Black Panther Xbox Sweepstakes? During the sweepstakes period you can visit sweepstakes page at BlackPantherXboxSweeps.com. Once you have reach out to the sweepstakes page then you need to enter your valid email address and must follow the online instructions to register by entering all information requested on the registration form. Participants may return to the Website and enter his/her e-mail address to obtain one (1) additional entry into the Sweepstakes. On or about May 30, 2018, Sponsor will randomly select five (5) lucky winners from among all eligible entries received during the Sweepstakes Period. Who Can Enter: This sweepstakes is open only to legal residents of the fifty (50) United States and the District of Columbia and Canada (excluding Quebec) who are 13 years of age or older at the time they enter the sweepstakes. When To Enter: The Xbox Black Panther Sweepstakes begins at 12:00 PM ET on May 8, 2018 and ends at 11:59:59 PM ET on May 29, 2018. Sponsor: Microsoft Corporation, One Microsoft Way, Redmond, WA 98052.